I don’t have any blog suggestions but have to say I am pretty down myself. While mostly this mood is political, not personal in origin, it doesn’t make it any easier to shake off. Sorry to not be more encouraging but at least you know you’re not alone. 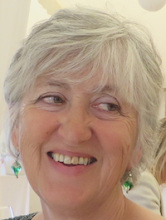 A lovely blog by Lynne Hatwell about her reading, life, quilting and travels. Hi Sue - I remember your television purchasing dilemma. This season is when a TV earns its space. - documentaries, travelogues, occasional quality dramas - all helpful to the seasonally affected. Only to be left gathering dust in the corner once the sun returns - but that’s ok - it’s done the job of dragging us through winter. I don’t have any blogs to recommend - only yours! Even when you’re feeling blue, I’m glad to read about it. Thank you, friends, for responding..
You're right, Phoebe. My low mood is largely but not entirely due to politics, but it doesn't make it easier to shake off than more personal stuff. I hope you feel lighter soon. Thank you, Lois. I will try Dove Grey Reader. Little Cotton Rabbits (sorry, no link but easily found) is a craft/autism/life blog that always warms my heart. Hope it - or something - helps. Thank you for the Little Cotton Rabbits! Oh yes, Jenetta, I,ike Quilt While You’re Ahead. Sorry you’re low. I like Anthony Wilson’s blog, which I think you recommended originally. He recently put on a link to Justin Wise and his ‘year of living deeply’, which I am attempting to do. Maria Popova has just produced a book called ‘A Velocity of Being: letters to Young Readers’. There’s a video on YouTube of some of the contributors reading their letters. I found it inspiring. Finally I follow Kate Davies and her knitting blog is the hope that one day I will progress from stocking stitch! She is an amazing woman who had a stroke in her thirties. Can’t wait to read your latest novel. Hello Anonymous and Barbara, thank you for your suggestions, I do read Brainlickings, it’s wonderful. I should put a link on my blog. I just checked out the readings in Youtube. And I do read Anthony Wilson. Thanks all for suggested links - I too am grateful for new input. As a sewer, I regularly check ‘Coco’s Loft’ (lives up to its billing of ‘a joyful sewing place’) and ‘Project Minima’ (to boggle at Pao’s sheer skill, whackiness and creativity). In fact your’s and Coco’s are my only habitual reads - when either of you are in retreat, it feels a real loss - I do need to get out more! Sorry you're feeling low Sue, I hope you're now feeling a little brighter. I only read your blog regularly 😊 but I see there are many lovely suggestions above. Letters from a Hill Farm is always cheering and House of Edward is excellent, her take on the politics of the day will warm your heart. Weaver of grass blogspot is also very sustaining, her indomitable spirit amazes me. She is a former teacher and farmer's wife living in the Yorkshire Dales.